May 1 till 18 at the Kami Goryo Shrine　上御霊神社, Kyoto. At Shimo Goryo Shrine下御霊神社 on a sunday near May 18. Ritual to appease the six "vengeful spirits" of enemies of the state. The rituals are now for these 8 vengeful spirits. Kyoto has suffered on many occasions from all kinds of bad omens, including epidemics, floods, fires, and earthquakes. To keep the spirits from being angry, special protective or goryo-e festivals have been held in Kyoto since ancient times. The first Gion Matsuri, one of Japan's oldest goryo-e festivals, was held in the early Heian period (794-1185) to stop a series of devastating plagues. These rituals and festivals are also held at other Shinto Shrines in Japan. Some are held during the O-Bon rituals for the ancestors.
. 御霊神社 Goryo Jinja, Kamakura . Kamakura Gongorō Kagemasa 鎌倉権五郎景政 "Gongoro san"
is the deity in residence.
. the vengeful spirits of the dead . posthumous Emperor Sudō (崇道天皇, Sudō-tennō). He was also made part of pantheon of ‘disgraced’ figures enshrined at the Shinsenen in Kyōto, in 863, to appease (rather than banish) troubled, even vengeful, souls. The others were Mononobe no Moriya (killed 587), Prince Iyo (executed 807), Fujiwara no Nakanari (executed 810), Tachibana no Hayanari (executed 842) and Bunya no Miyatamaro (executed 843). One such story is “The Curse of Prince Sawara,” said to have been one of the reasons for Emperor Kanmu to relocate the capital to Heiankyo in present-day Kyoto in 794, only years after moving it to nearby Nagaokakyo. It is said that Crown Prince Sawara, the emperor's brother, was framed for an assassination and died of indignation, and that Emperor Kanmu was haunted by his vengeful ghost because a number of imperial family members died afterward. 桓武天皇 . Prince Sawara (早良親王, Sawara-shinnō) . Possible reincarnation of Sugawara Michizane . . . The kenboko is a ritual apparatus used to appease evil spirits. In festivals, it takes the lead position during the passage of mobile shrines. The shape of the kenboko has been linked to such ancient weapons as bronze swords and halberds, although the connection is by no means definite. Of more certainty, is its association with belief in the spirits of the dead, during the Heian Period. In 869, during the first Gion Goryo-e (meaning "service for souls"; later to become Gion Matsuri), 66 tall spears (hoko) were erected in Shinsen Garden, after which prayers were offered in the hope of driving away the pestilence then ravaging the city. Nenjugyoji Emaki, a series of picture scrolls depicting annual events from the Heian Period, show a festival hoko leading the passage of a mobile shrine during Gion Goryoe. Historical materials from around the beginning of the Muromachi Period show kenboko in forms close to those of the present day. The rakuchu-rakugai-zu folding screen illustrations in the Uesugi Family Book from the late Muromachi Period show a Goryo-sha kenboko procession. 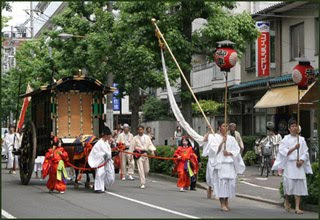 Kenboko serve to appease evil spirits by appearing in festivals in a ritual called kenboko-zashi (bearing of the kenboko). People who come under the protection of the deity to whom the shrine is dedicated are responsible for looking after the kenboko. The kenboko themselves are procured by the local community or a Hoko Association. Therefore, kenboko do not usually belong to a shrine. Rather, they are the property of a community in that shrine's jurisdiction, or a Hoko Association. Each year the kenboko is passed to a different residence in the community, where it is feted for the following 12 months. This practice is called toya-kazari. A kenboko is typically made up of kensaki (point of the sword), shingaku (deity plaque), kazari (ornamentation), fukichiri (standard) and rin (bells). All of these are attached to a long pole. The kensaki is made of thin metal, while the shingaku carries the name of the shrine, the deity to which it is dedicated, and the name of the era from which it derived. Kazari, or ornamentation, includes crests and heraldic emblems of plants and animals, elaborately crafted in metal. Each kenboko takes its name from the kazari designs. When carried in procession, the kenboko is placed vertically in a pouch secured around the waist. As the bearer walks, he moves the kenboko back and forth, up and down, all the while ringing the bells. As kenboko are 6～7 metres long and weigh about 60 kg, this kind of movement calls for a high degree of skill. Three large ox-drawn festival floats are paraded around town. A Shinto shrine located in Kita-ku, Kyoto, Japan. It was originally established for patrons to pray for safety from an epidemic, though it has evolved into a shrine where patrons can pray for general good health. On every second Sunday in April, one of the 3 major festivals in Kyoto, Yasurai Matsuri 安良居祭 (やすらいまつり), is held at the shrine. The word imamiya (今宮) means "newly constructed. There are several attractions that are unique to Imamiya Shrine. Specifically, there are two longstanding restaurants adjacent to the shrine. These shops' specialty are aburimochi - skewered, roasted rice cakes that are a traditional Kyoto confection. The two restaurants, named Ichiwa and Kazariya, have been open since 1002 and 1656 respectively and are located immediately outside the shrine's east gate. ***** . Sugawara Michizane　菅原道真 . This wild and fearful deity can not be seen or heard by humans.
. goryoo 御霊 Goryo- vengeful spirits .